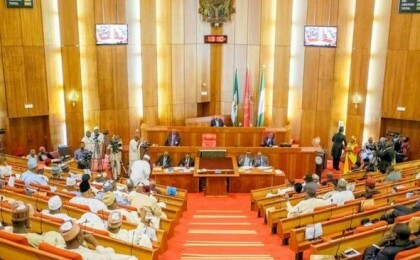 The Senate has expressed surprise at a recommendation by the Nigerian Law Reform Commission for a review of the Nigerian Foreign Exchange (Forex) Act in order to empower the Central Bank of Nigeria to jail people for up to two years or fine them for 20 percent of the amount of the foreign currency held in their possession for more than 30 days. The Senate in a statement signed by its spokesperson, Senator Aliyu Sabi Abdullahi stated that with its focus on boosting investor’ confidence in the nation’s economy, such move as proposed by the Commission that will prevent investors from making free entry and free exit from the market will be outrightly rejected by its members. “The measure is disruptive and counter productive, threatening to undermine many of the reform efforts already underway in the legislature and by government ministries intended to boost investor confidence. “The Senate would never pass such a punitive and regressive proposal. Overall, some of the Commission’s recommendation has many sound attributes and could help Nigeria’s investment climate. We believe the CBN should have the authority to regulate the forex market and determine the exchange rate policy as already enshrined in its enabling Act. ” A market-oriented exchange rate policy is the best recipe for guiding the operations of the foreign exchange market. This will ensure the supremacy of market mechanisms in efficiently allocating the scarce forex resources”, the Senate stated. The proposed changes are said to be intended to help control capital flows and prevent foreign exchange from being taken out of the country. Also in June, the CBN was cheered for loosening its control over exchange rate policy in a bid to encourage investors to return to Nigeria and prevent capital flight. Hopes were high after the Nigerian government finally allowed the naira to float, as was recommended by domestic and international investment advisors. Currently, however, the markets do not reflect a loosening of CBN control over the forex market, leading to the emergence of multiple exchange rates. FOR BOOKING CÓNTACT THE SÁLES MÁNAGER Mr Amune Emmanuel on +2348036909383 OR ASSÍSTANT SÁLES MÁNAGER ON Mrs Grace On 08060478998 TO MAKE YOUR ORDER.